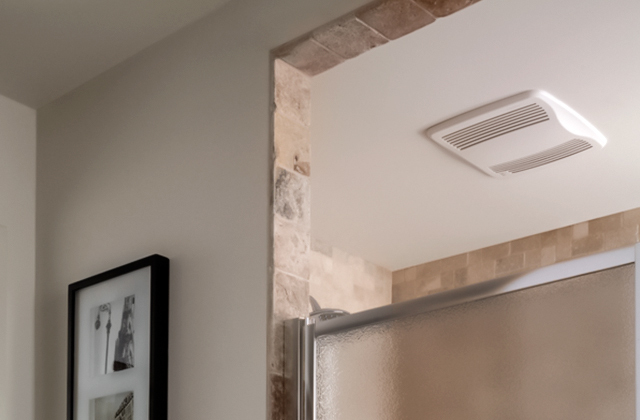 With all the necessary hardware included, you can either hang the heater on the ceiling or mount it on the floor. And in both cases, the control panel will be easy to reach and use. At maximum power, the unit is somewhat noisy. Offering a number of heating scenarios, this model is designed for heating up pretty large greenhouses up to 25 sq.m. This makes it perfectly suitable not only for domestic use but also for use in non-residential premises like warehouses or garages. Up to 25 sq. m.
The paraffin oil container boasts 4.5L capacity saving you the need to refill it too often. With the consumption of about 0.054L per hour, it will last up to 90 hours. Some parts become rather hot during operation. 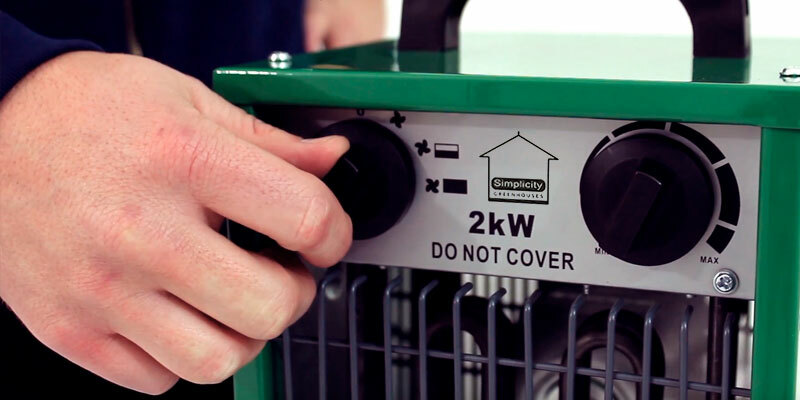 A paraffin heater is a fully independent source of warmth that needs no connection to electricity or gas supply, making it an ideal choice for smaller greenhouses without access to the grid. And it is absolutely safe and even beneficial for plants since it produces carbon dioxide which promotes stable growth. Up to 5 sq. m.
Made of powder coated stainless steel, the unit body is corrosion resistant allowing for safe heater operation under high humidity. And the IPx4 protection class makes it suitable for places with high condensation. The affordable and powerful at the same time greenhouse from Simplicity is one of the best models for medium-sized areas up to 20 sq.m. Fitted with a digital thermometer, it will let you precisely monitor the microclimate for cultivating and growing the most exacting species. 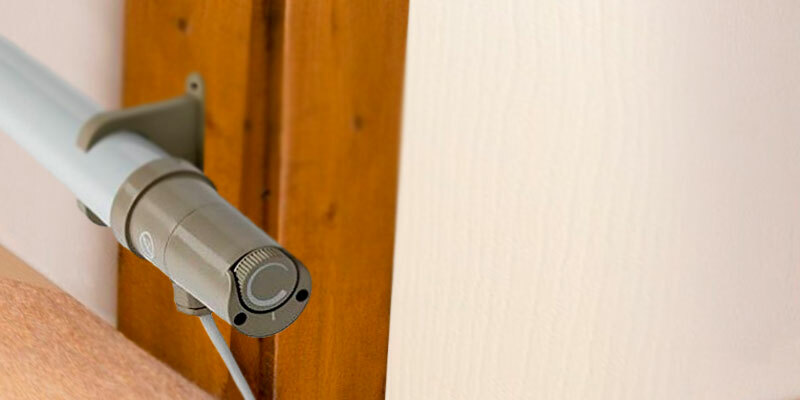 Safety Cut Out protection function will prevent the heater breakdown in case of voltage drops while a reversible cable entry makes it easy to connect the unit to the nearest socket. Mounting bracket screws could be more solid. 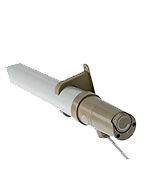 Although this model will not be able to quickly heat large premises, it will come in handy in places whether it is necessary to consistently maintain a no-frost temperature. Designed for continuous operation, it's a great choice for a small basement, pump station, home workshop, shed and a great option for a small domestic greenhouse or even a vivarium. Up to 6 sq. m.
Metal feet feature non-slip inserts to provide maximum stability on any surface. 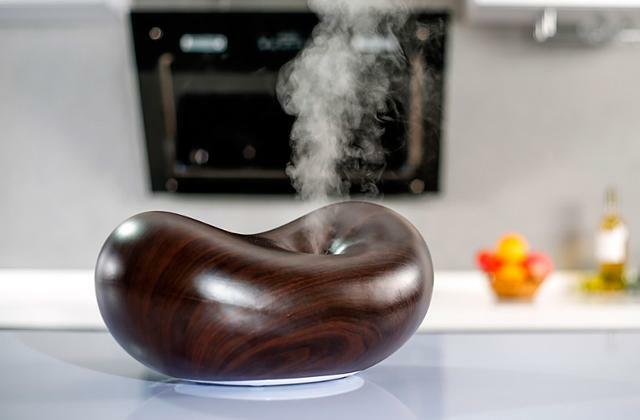 And the rotating mechanism allows precisely directing the airflow to where you need the added heat. The model is sensitive to voltage drops. 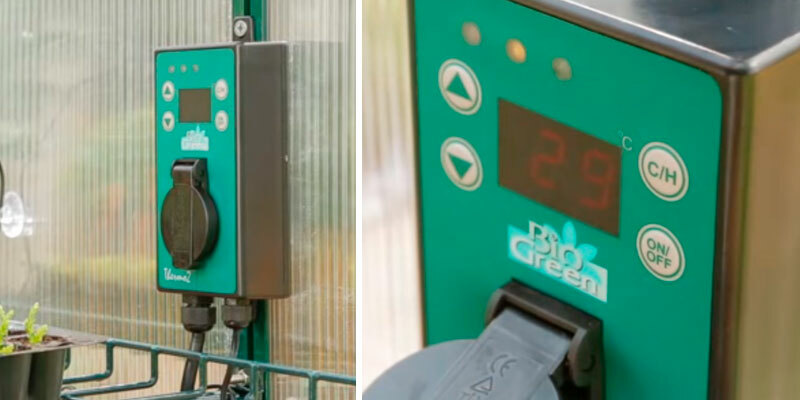 If you seek an efficient greenhouse heating solution to deliver maximum warmth with minimum energy consumption, the BioGreen Palma is hands down the best model to go for. 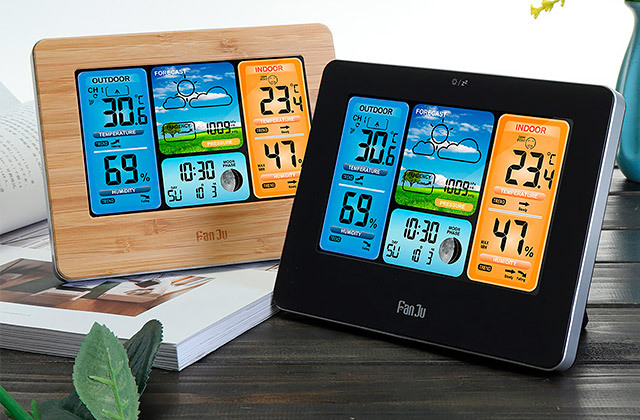 Coming complete with a digital thermostat, it will securely maintain the set temperature with the accuracy of 2°C. Up to 16 sq. m.
If you own a large greenhouse to grow veggies, greens, and berries not only for your family but also to sell them on the farmer’s market or supply to small groceries, efficient greenhouse heating is a must to maintain consistently high produce even in winter. To cover larger areas with minimum costs, you need a powerful yet energy-efficient, compact yet performing, and reliable heater that will faithfully serve you season after season. 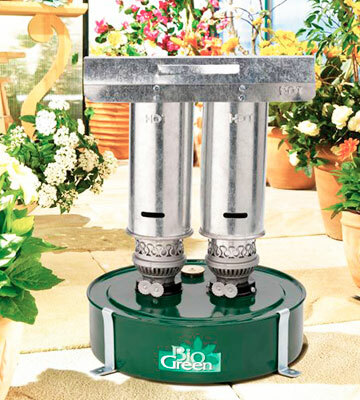 And you’ll get all of this with the Phoenix greenhouse heater from Bio Green. 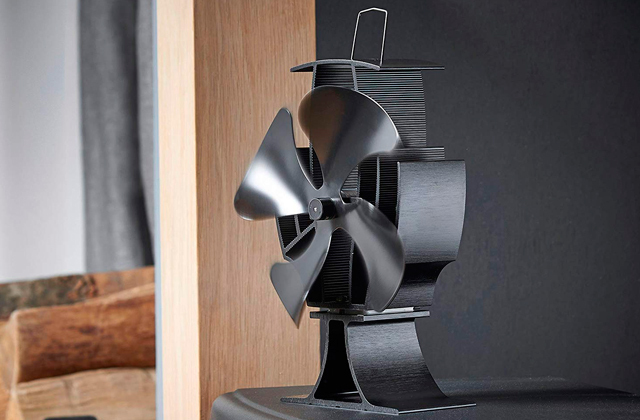 This electric model packs 2800 watts of power and features fan technology to heat areas up to 25 sq.m. The heating element consistently generates heat while a forceful fan will ensure even warm air distribution around the greenhouse circulating about 460 cu.cm per hour. What’s more, unlike in other models, the heating element here is all high-grade steel. It doesn’t turn red and is not prone to overheating. 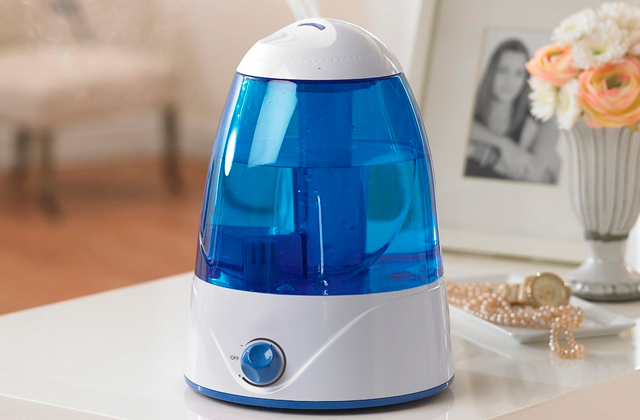 Hence, you can be sure it will deliver smooth uniform heat without overdrying the air. The whole unit is solidly built and will withstand everyday use in different environments. The body is made of stainless steel that is resistant to damages and rust. Besides, the entire construction is IPX4 approved for safe use in high-humidity conditions. 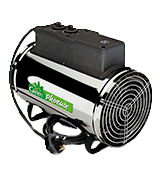 For your convenience, the Phoenix heater is designed to be installed in different positions. Two sturdy mounting feet will keep it stable on any floor surface or you can mount it on the ceiling using the hardware already included in the set. Whatever installation option you choose, all controls will be within easy reach for hassle-free unit operation. A distinctive benefit of the Bio Green Phoenix heater we can’t leave unnoticed and you can’t but like is a fully customisable unit operation. Fitted with an adjustable thermostat, the model offers various heating scenarios to meet different greenhouse needs and demands. You can choose between 3 power output options ranging from 1 kW to 1.8 kW to 2.8 kW and as many as 10 temperature settings. A combo of lower heat and temperature works great for the first autumn colds and mild spring season while peak settings will come to help in the height of winter. The thermostat features sensors on the outside to match the outside temperature and not the temperature of the heater itself. This enables constant and precise temperature adjustment and control from 0 to 26 degrees Celsius. Moreover, such thorough heat control allows minimising energy consumption despite the high power of the unit. 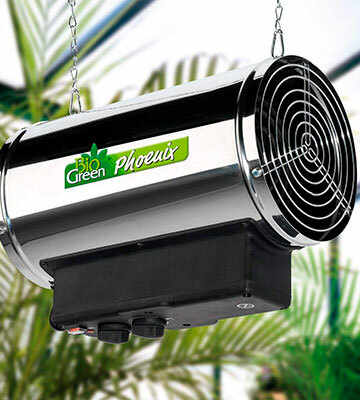 To conclude, if you are looking for a functional and reliable heater to maintain the optimal warmth in a large greenhouse, the Bio Green Phoenix is one of the best greenhouse heaters that will meet the most exacting needs. When planning to build a greenhouse, many gardeners wonder where to place it. Some choose to build it close to the house or even make it part of the building to have free access to the utilities while others don’t have many options and place it in a distant corner of the garden without connection to the mains. 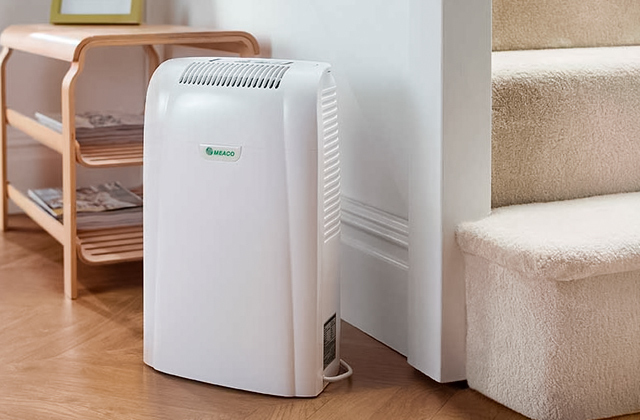 If that goes for you too, we recommend you consider the Warmax Power 5 heater from Bio Green. The unit consists of two tubular burners fixed on the top of a circular oil container and offers a very simple operating principle. 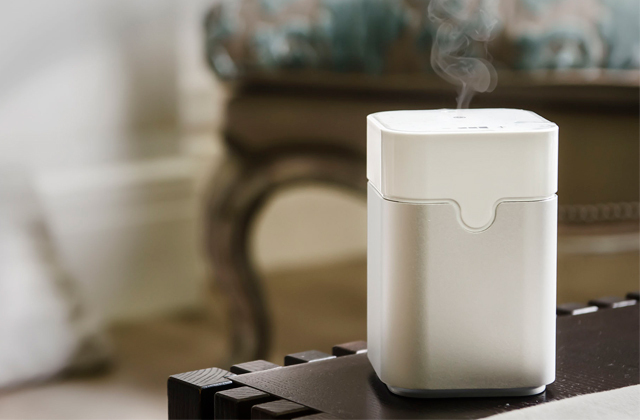 The wick is immersed into paraffin oil in the container and connected to the burner in the tube that exudes the heat to the outside. Two mechanical wheels on each burner allow you to adjust the flame height, thus varying the amount of the heat. This dual burner model can maintain consistently warm air on the area of about 5 sq.m. This makes it best suitable for small to medium-sized constructions and orchard houses without access to the grid. That said, to save on gas and electricity and cover a larger area, you can always install several paraffin heaters. 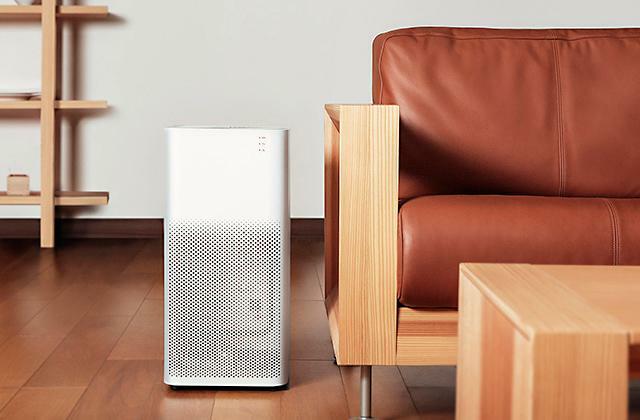 All-made of first-class steel, the heater is definitely designed to last. The whole construction is solid, sturdy, and rustproof. 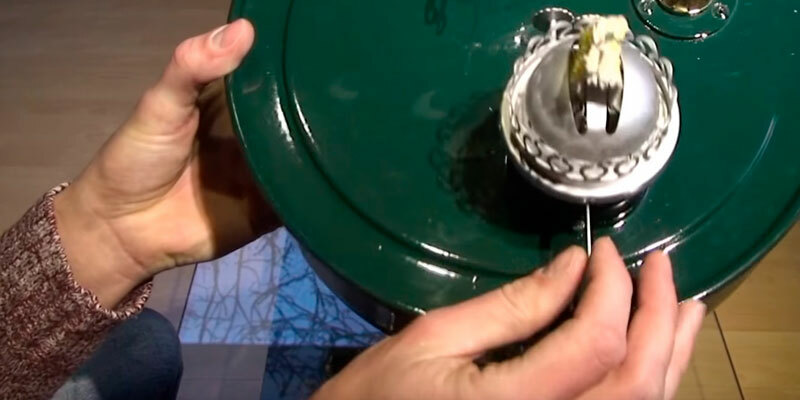 A circular flat base of the oil container ensures stability and prevents skidding. Moreover, the heater is fitted with anti-tilting mounting brackets for added stability and to avoid accidental tip-overs. At a glance, a paraffin heater might seem not reliable enough in terms of performance since, unlike electric counterparts able to operate as long as you need, paraffin models need constant refilling. However, with the Bio Green Warmax, you won't have any issues. Fitted with a 4.5 L container, the unit will save you the need to refill it too often. Consuming about 0.054 L per hour and fitted with an extra-long 33-cm wick, the unit will burn up to 90 hours before needing more fuel. It means, you can leave it for a couple of days and it won’t run out of fuel in the middle of the night. And there will be no trailing cables or gas pipes limiting its place of installation. Plus, when burning the heater will emit carbon dioxide, a colourless gas notorious for its ability to enhance natural photosynthesis and promote the growth of plants. 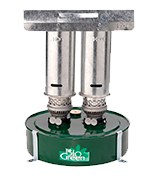 All things considered, the Warmax paraffin heater from Bio Green is an efficient, economical and fully independent source of consistent moderate warmth for small to medium greenhouses and a great alternative to constructions without connection to electricity or gas supply. To keep their domestic greenhouses warm in winter, many home gardeners use ordinary floor standing fan heaters you’d normally use to warm up your living space. Yet, most of them go out of order pretty quickly since they are not meant to function under close to freezing temperatures and withstand increased humidity. So, sometimes, it’s not worth saving on buying a specialised heater. Moreover, not all greenhouse heaters are too costly. There are a lot of budget-friendly models distinguished by exceptional quality. And the Simplicity TSE-20A is one of them. To fit into a humid greenhouse environment and ensure safe use under wet conditions, the model boasts an IPX4-rated construction. It means the unit is securely protected not only from condensation moisture but also from accidental splashes when you water your plants. Besides, a robust steel casing is powder coated for added protection and will show no signs of rust or corrosion even under extensive use. When it comes to the coverage area of this unit, it depends on how warm you want your greenhouse and, of course, on how cold it is outside. In general, with the power of 2000 watts, the Simplicity will efficiently heat the area of 20 sq.m. By saying “heat”, we mean consistently maintain the air temperature high enough above zero while the outside temperature is not freezing. But the heater will also cope with larger areas if you only need frost protection. Another thing we can’t overlook is a pretty compact and easy to handle unit design. 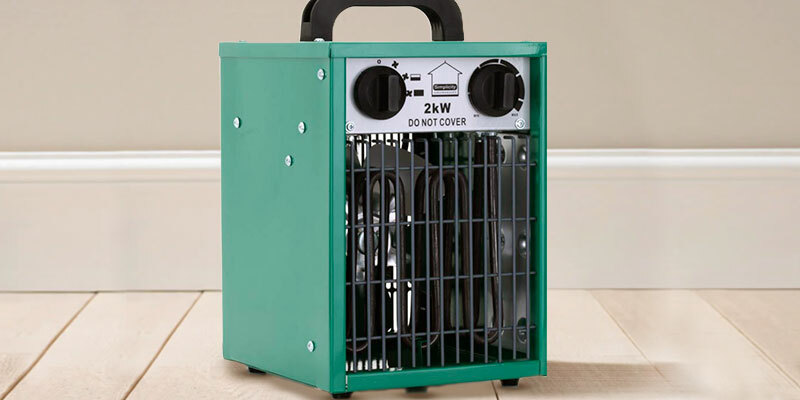 Packed in a box-like housing and fitted with four sturdy feet, the heater needs no bolting or mounting and will stand stable on any flat surface. Meanwhile, a lightweight construction and carry handle make it extremely portable and you can easily move it to any place you need. All gardener needs are different. Some grow greens and veggies to enrich their menu with vitamins in winter while others go into flower raising. The point is that various plants require maintaining different greenhouse conditions. 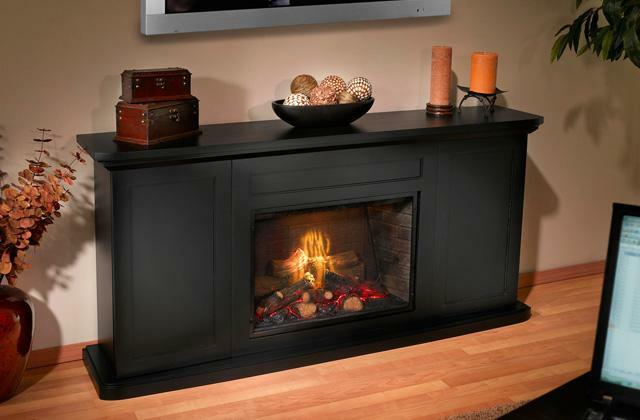 This is where you’ll need perfect heating performance adjustability offered by the Simplicity heater. Coming with an adjustable thermostat, the unit allows choosing between several temperature settings that range from max to min. Once the set temperature is achieved, the heater will click off and switch on again to maintain consistent warmth. 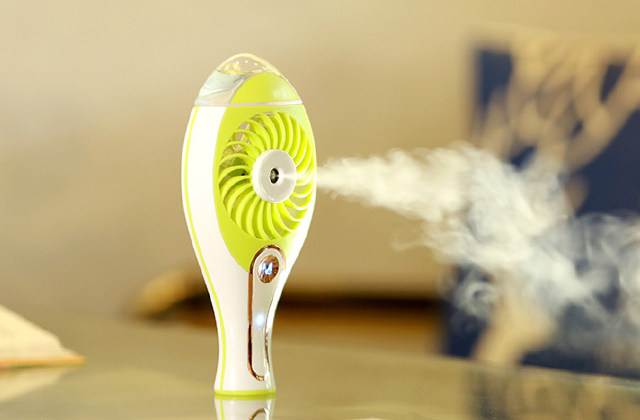 And three fan options will let you customise the blowing intensity. 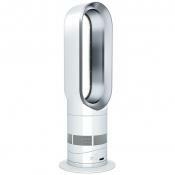 You can go for low or high heat during the cold season or choose only ventilation to improve air circulation in summer. Other than that, the package includes a thermometer. Not only will it help you precisely control the temperature and adjust the heat accordingly but also it will maximise the unit performance to save energy costs. To cut a long story short, affordable, powerful, and flexible, the Simplicity is hands down the best option for warming up medium-sized greenhouses and cultivating the most exacting plant species. 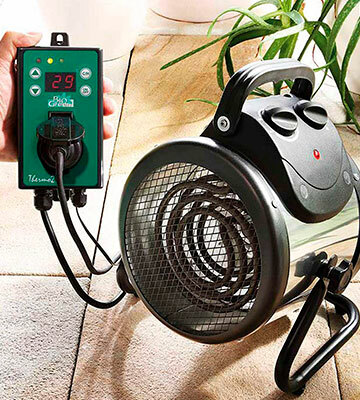 Need an economical and functional electric heater for a small-sized greenhouse and other smaller spaces? If so, look no further. 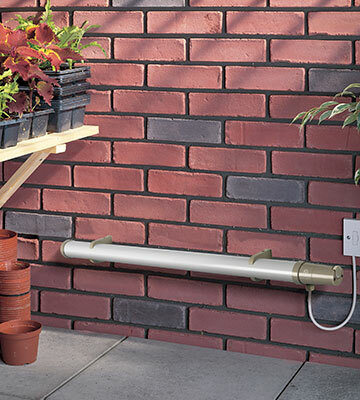 A low energy tubular heater from Sunhouse will get you covered. Powered by an 80-watt tubular heating element, the unit is meant for places and spots up to 6 sq.m in the area. 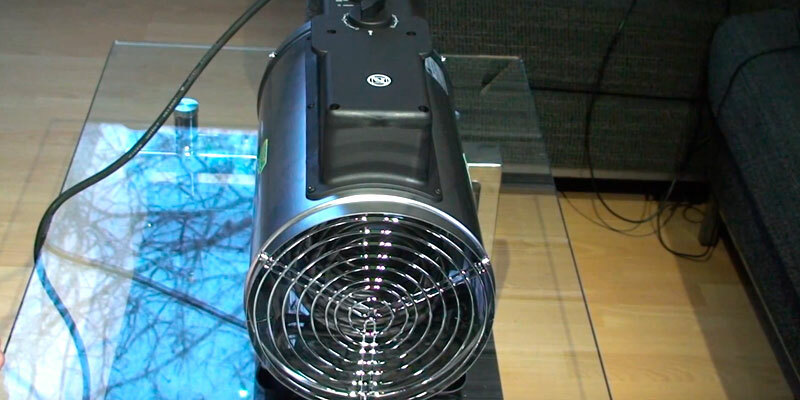 Unlike fan heaters circulating hot air, this model provides radiating heat. 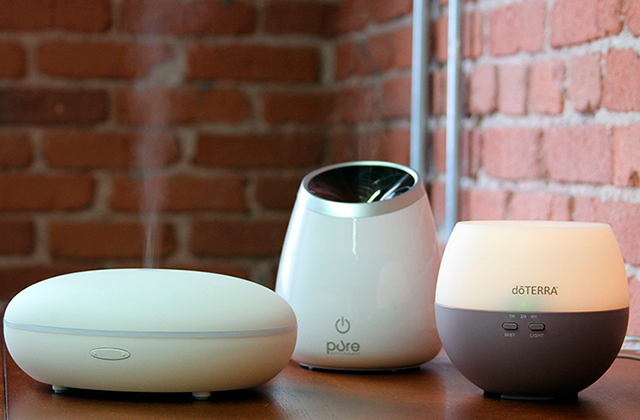 It directly heats the atmosphere around and features a much lower risk of overheat. This type of heater can be safely installed close to the plants or right over the trays and boxes with seedlings since it doesn’t produce a hot air flow and will delicately “embrace” the plants with tender warmth without overdrying. More than that, the biggest benefit of the radiator is that it is intended for continuous operation. An adjustable mechanical thermostat will let you set the desired heat output and the unit will reliably maintain it as long as it is plugged in. To quickly heat up the space and ensure maximum heater performance afterwards, it’s recommended to first run the heater at full power until the required temperature is achieved and then set back the thermostat dial to lower heat that will be controlled automatically. Offering non-stop operation and automatic ambient warmth control, the Sunhouse is kind of a set-and-forget option that can be used in many different ways. Though alone it will hardly efficiently heat up a large area, several units can do it really great without raising your utility bills too much, taking into account extremely low energy consumption. On the other hand, the model is definitely a real find for spot heating and small spaces. Providing added heat for temperature-sensitive plants, warming up a pump station, small workshop, garage, home gym, a storage room or heating a small vivarium or conservatory, the Sunhouse can handle all that. The Sunhouse heater comes in a slim tubular design that makes it convenient to use and install. 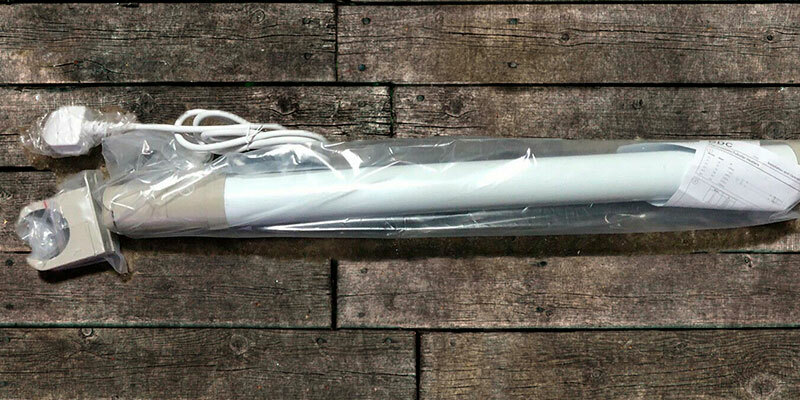 70 cm long and only 8 cm in diameter, the tube will perfectly fit into narrow spaces not much limited in length. The model provides for wall mounting and the package already includes mounting brackets. Besides, the cable entry is reversible making it easy to connect the heater to the nearest socket. As simple as it is, the Sunhouse features a number of protection options to make it safe for the use in different environments. Thus, the safety cut-out function will prevent the heater breakdown in case of voltage drops and IPX4 rating ensures it has a splash-proof housing suitable for greenhouses, laundry rooms, bathrooms, non-heated porches, small outdoor storages, and other spaces. In conclusion, if continuously maintaining no-frost or relatively low greenhouse temperatures rather than creating a toasty environment is what you need, you’ll be hard pressed to find a better option than the Sunhouse. Maintaining a favourable greenhouse atmosphere in winter is not an easy task and requires constant monitoring of the temperature, which can be easily done with the help of the premium-quality Bio Green Palma heater. 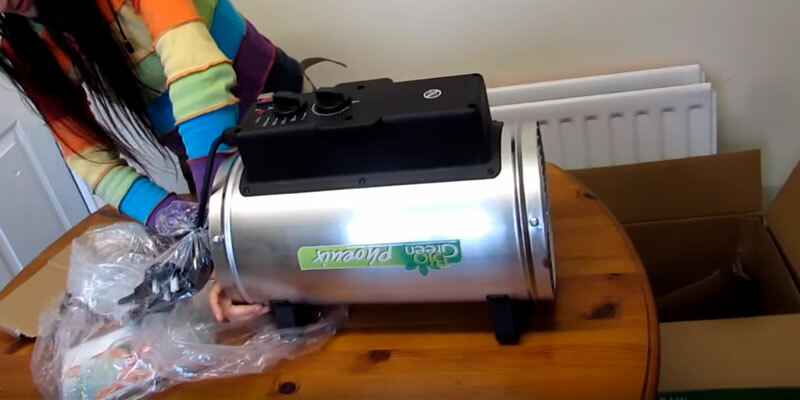 Though a bit pricey, this heater has a lot of perks making its use more convenient and efficient compared to many others from similar price range. First things first, the unit was thoughtfully designed to withstand greenhouse conditions. It boasts rugged stainless steel construction and solid build. Intended for floor use, it features a curved wire stand that rests on small rubber feet to keep the unit above the ground, ensure perfect stability on any surface, and prevent skidding. Meanwhile, a large handle on the top makes it easy to carry and adds mobility. 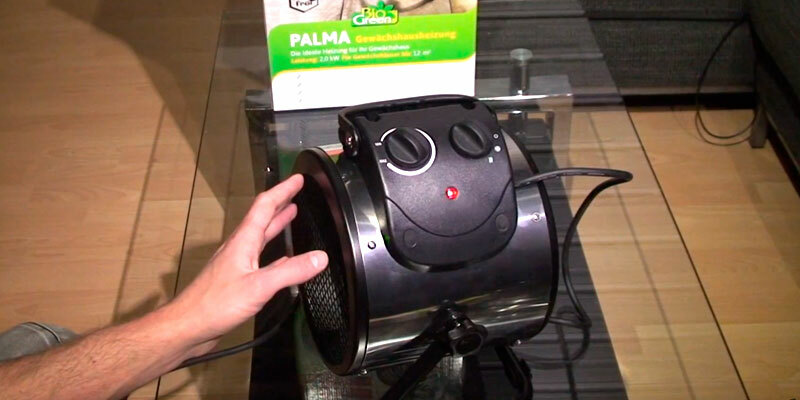 With the IPX4 rating, the Palma heater will flawlessly operate even in high-humidity and moist areas. So, it won’t be damaged by some water drops or accidental sprays when you irrigate your plants. However, it should be stated that the unit is not waterproof and you should keep it away from the sprinklers operating range. 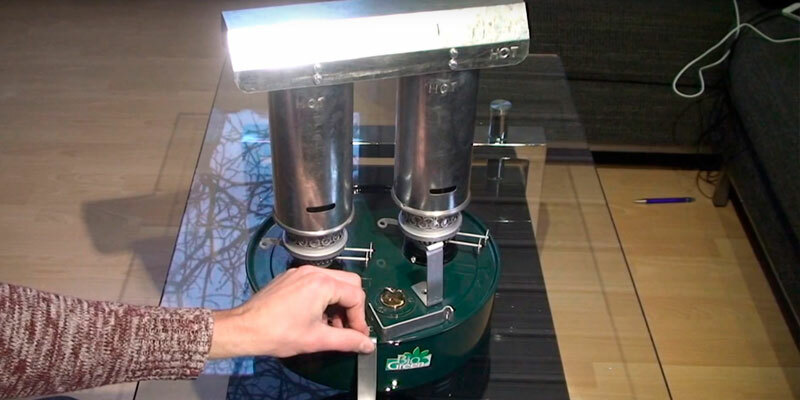 The metal housing hosts a 2000-watt coil heating element delivering sufficient heat output to cover up to 16 sq.m. An adjustable thermostat allows choosing between numerous heat options up to 85 degrees Celsius and setting the operation mode either to heat or ventilation (which is a great function to prevent mould growth in summer). 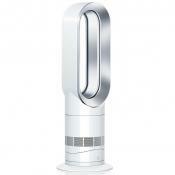 In addition, a built-in fan can move up to 163 m3/h ensuring efficient air circulation and quick heating. A dependable design and adaptable heat performance make this model a good choice not only for greenhouses but also for basements, garages, damper rooms, outbuildings, closed terraces, patios, and storage areas. Greenhouse gardening is a kind of science. While some plant types can easily endure temperature changes, other species appear highly sensitive even to a single temperature drop or rise. In particular, it is true about new breeds, cross-cultivated species, exotic flowers or fruit, and seedlings. In this case, precise temperature control becomes priority. Along with a built-in mechanical thermostat, the Palma heater also comes equipped with a digital thermostat. 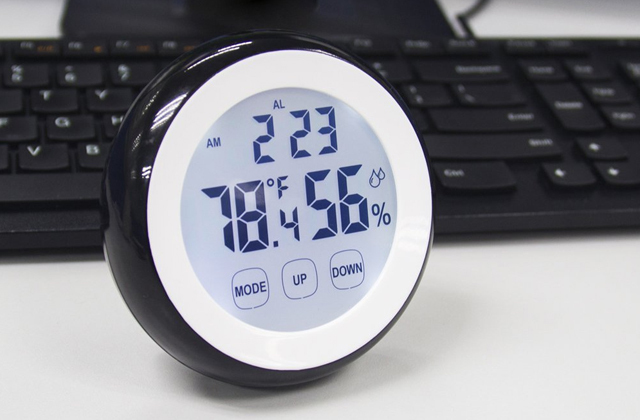 Displaying the current temperature, it will let you precisely set the heating temperature and maintain it with +/-2 °C accuracy. 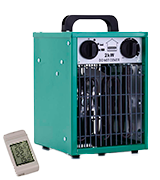 What’s more, in contrast to many other models in its class, this unit allows selecting the temperatures not only from a positive but also from negative range (- 50°C to 99°C). Though it might seem strange for newbies, any experienced gardener aware of the importance of a negative temperature for the root of some plants will appreciate this option. 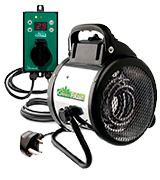 All in all, super-accurate, durable, and functional, the Palma heater is a win-win solution for literally any greenhouse-gardening needs and even more. What Is a Greenhouse Heater? Today greenhouse gardening is extremely popular among gardeners of all levels. Professional horticulturists, for example, own whole greenhouse farms to grow a variety of fruit and vegetables throughout the year, which allows for the abundance of all sorts of greens, veggies, berries, and fruit in stores even in harsh winter. Experienced home gardeners often build up greenhouses in their backyards and use them to not only grow lettuce or strawberries but also raise some new types of plants, flowers, and herbs as well as exotic fruit and flowers that wouldn’t strike roots in the open garden. Greenhouses effectively trap and retain sun heat, creating a favourable microclimate for plants to grow. However, in order to use them during cold months as well, you'll definitely need some additional heating solution. This is where greenhouse heaters will come in handy. Normally, a greenhouse heater is a pretty compact unit you can put where it is convenient for you and stow away when the winter season is over. Besides, some models can be used for heating up a garage, basement, workshop, or a closed terrace. Whether your arsenal of garden tools is complete or you’ve just started building it up, good secateurs wouldn’t go amiss. A pair of quality pruning shears will help you accomplish a number of cutting jobs. Greenhouse heaters come in a variety of models and types and can be used in domestic greenhouses as well as commercial premises. This, however, can make it rather tricky for novice gardeners to select a heating system that will cater to their needs. To help you out, we've summed up the main features that you should pay attention to when choosing a heater for your greenhouse. Generally, there are electric heaters and non-electrical models, powered by different kinds of fuel. Electric heaters are the best option for those who have greenhouses with access to electricity. 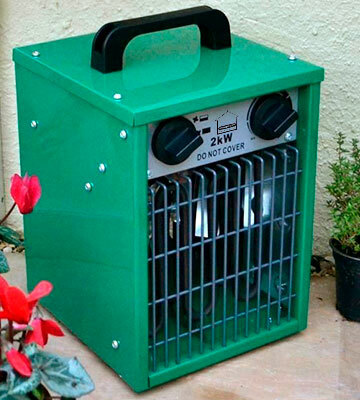 Electric heaters are by far the safest models since they produce no fumes and need no refuelling. Hence, you can leave them unattended. Besides, many electric models are fan assisted, ensuring highly efficient warm air distribution and feature an adjustable thermostat for precise temperature control and maintenance. Though safe and a snap to use, electric heaters are not the most cost-effective solution in terms of energy costs. Propane heaters make a great choice for medium to large greenhouses without electricity. Powered by bottled propane, they are the least expensive to run. However, there are a few downsides to them. First of all, you'll need to hold a stock of propane bottles to refuel the heater. Secondly, the maintenance of the heater is quite high. And thirdly, the heater produces fumes, which makes a regular greenhouse ventilation a must to prevent any negative effect on the health of plants. Paraffin heaters are another alternative to greenhouses that are installed away from the grid. Like propane models, they also need refilling and proper maintenance. Yet, in contrast to those, paraffin heaters work better for small greenhouses or cold frames. Before you select a heater, you should measure the area you want to warm up - this factor will help determine the power of the heater you need. The higher the unit’s power, the larger area it will be able to effectively heat. To estimate the optimal power output for your greenhouse, use this simple calculation: 1 kW of power can heat about 5sq.m and provide frost protection for about 10 sq.m. The unit overall dimensions are also an essential checkpoint, especially if you don’t have a lot of free space in your greenhouse. So, make sure the heater fits the area. On top of that, some electric models offer ceiling mounting that makes them an option for cramped and space-limited structures. Electric models are undoubtedly the best in terms of temperature control. Not only do they provide several heating modes but also they allow maintaining the chosen temperature with high accuracy and often even have a ventilation mode to ensure due air circulation during the warm season. When it comes to gas and paraffin models, the temperature control there is pretty basic and you can change it by simply adjusting the height of the flame. Serving as a secure shield between nature and the crops you grow, greenhouses have a whole number of advantages to offer that go beyond only a longer growing season. Weather conditions don’t matter. Maintaining a garden in areas with quickly changing weather is not an easy task. Pouring rains and harsh winds can ruin flowers and saplings. In a greenhouse, everything is covered and stays dry irrespective of the weather vagaries. Grow anything you want. With a greenhouse, you are free to raise not only local plants but also some exotic species that won’t normally survive in a cold climate. Keep pests at bay. Greenhouses protect your plants not only from bad weather but also from pests such as deer, squirrels, rodents, and insects. Easy customisation. Building up a greenhouse, you can customise it to your personal needs. You have a chance to create a favourable growing environment for any types of plants you intend to raise to harvest a healthier and heavier yield. Precise control over your produce. Growing vegetables, herbs, greens, and fruit, you can always be sure you eat fully organic and fresh products free from pesticides and any other toxic chemicals often used commercial horticulture. No matter how good the heating system you choose for your greenhouse, it won’t be 100% efficient if the whole construction is not duly insulated. Unless you are ready to pay extra for the energy, to get the maximum out of your greenhouse heating with minimum added costs, appropriate greenhouse insulation is imperative. Our basic tips below will help you minimise draughts and lower your energy bills. Check that all doors, vents, and panes fit snugly and have no damages. If there are any cracks or breaks, seal them. If you have some plastic panels, it’s recommended to tape seams and joints to prevent warm air leaks. Use special horticultural bubble wrap to insulate your greenhouse. You can staple or tape it to the structure frame. Just mind cleaning windows first to reduce the light loss since bubble polyethene cuts out some amount of light your plants need. And there is a little trick: the larger the bubbles, the more light they allow in. To trap the heat accumulated during the day, for the night it is recommended to make kind of insulation curtains using thermal insulation foil. Besides, you can recycle plastic bottles and use them as mini cloches. It will cost you nothing, yet, can work as a great added overnight protection for cold-sensitive plants. Seedlings in trays and pots are the most vulnerable during the colder season since their roots are prone to freezing. To retain heat, you can wrap the pots with a bubble wrap as well or use old polystyrene boxes stuffed with newspapers or straw. Make use of insulating properties of snow. If there are heavy snowfalls in your area and your greenhouse structure is solid enough to carry some extra weight, don’t hurry to clear away the snow blanket. Just remove some snow from the sunlit part of the roof to let the light in.